Robert Redford crunched into a City Hall elevator among regular Vancouver citizens last week on the way to the movie set of, "The Company You Keep," rumour has it. The 75-year-old Hollywood legend is in Vancouver. He has been directing his latest feature film here since mid September. Don't know what the big fuss is about? Just ask your mom. Story started to circulate around the office that the movie was now possibly being filmed at City Hall. A quick run to the Hall, and it became a little clearer. "He has been in here a couple of times," an older woman behind the information desk said. Her eyes lit up. "I heard he was a nice guy." She said that she wasn't working on the days that they were filming and had "missed all the fun things." The woman said that she had heard from her hairdresser that Redford was filming at City Hall last week. Her hairdresser's wife works at the production company that had brought him there. Suddenly, the receptionist was in her 20s and couldn't stop smiling. She went on to say how she, too, is about the same age as Redford, all the while giddy talking about it, and how she imagines that the people would have been "thrilled", and was "awestruck," herself. She said that "he was one of the fabulous actors." The woman asked to be unnamed, as the City may not approve, and sent me to the security guard, who might have a "clue," just to the left. As I was about to knock, a tall man opened the door. He was with security. "No, they aren't here at the moment," he replied when I asked if he had heard anything about Redford filming in the building. He said that Redford was there last week. Excitedly, I asked, "Was it fun having him here?" He looked at me, straight faced, and said, "Not really." "We never saw him," he said, "but it was a bit of an inconvenience for them filming here." He sent me to the fourth floor, the once-temporary set of Redford's thriller. The security guard said that he didn't think anyone would have more info. I went anyways. In the elevator, I struck up a conversation with a suited man who looked like he was about to take a break. It was 10 a.m. "This whole area was very busy. They stopped access here," he recalled. The old, golden elevator came to a stop. No Robert Redford. The fourth floor was desolate. Stacked doors leaned against the wall and what looked like set lights and equipment could be seen outside, a lone man in the process of working on it. No one at City Hall seemed to know where they had gone next. According to "The Company You Keep" Facebook page, the cast and crew were seen filming at Hotel Georgia on November 19. Redford, an outspoken activist/enviromentalist, was also located in the midst of Occupy Vancouver, just south end of the Vancouver Art Gallery, last week, CBC reports. He was not seen talking to any of the protesters. 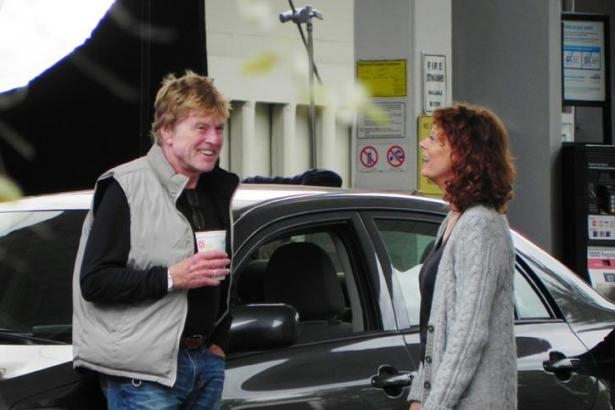 Redford's also acting in his newest motion picture, alongside Shia Labeouf, Susan Sarandon, Nick Nolte, Julie Christie, Stanley Tucci and Stephen Root. The filming is scheduled to go until November 25, and the movie is set to open in 2012.